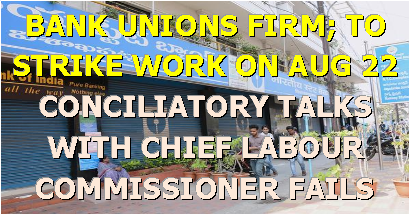 NEW DELHI, AUG 18: Bank unions have decided to go ahead with a nationwide strike on August 22 following the conciliation meeting convened on Friday by Chief Labour Commissioner AK Nayak not yielding any tangible results on their demands. “We wanted an assurance that the Prime Minister and the Finance Minister will give a statement that there will be no privatisation of banks and no mergers of public sector banks. As no such assurance came at today’s conciliation meeting, we have decided to go ahead with the August 22 strike,” CH Venkatachalam, General Secretary, All India Bank Employees Association (AIBEA), told BusinessLine here after the meeting. Talks between the Indian Banks’ Association (IBA) and the unions held in Mumbai on Wednesday, to avert the nationwide strike, had also failed. At Friday’s conciliation meeting, IBA was represented by SK Kakkar, Senior Advisor - HR. Venkatachalam said he had at Friday’s meeting also sought an assurance on recovery of loans from large corporate houses (bad loans), but nothing came the way of the bank unions. On the policy stance on privatisation and mergers, the government has been contradicting the RBI Governor and Deputy Governor, according to Venkatachalam. DT Franco, General Secretary of the All-India Bank Officers’ Confederation, said that Friday’s talks between the United Forum of Bank Unions (UFBU) and the Commissioner failed to find common ground. The unions were merely told that the government did not have any plans to pursue privatisation of banks, or mergers and acquisitions ‘at present’. This was at best in the nature of an assurance, and lacked any serious expression of intent, he said. The government negotiating team was led by Nayak, Kakkar and Manish Kumar, Joint Secretary, Department of Financial Services, Ministry of Finance. UFBU was represented by Franco, SK Bandlish, Convenor, and Venkatachalam. Franco ruled out any other window of reconciliation in the four days left for the strike. It appeared as if the government team was not serious in averting a strike, he said. It was merely a formality that the meeting had to be called since it is mandatory when a strike notice is served, Franco added.